This past December and January has seen two “bugs” come to Central Florida. One of them is an upper respiratory, like bronchitis or the common cold. The other one is a stomach bug. The second one made its way through my, usually healthy, family (that’s why this entry is a week late). But there is an herb I turned to that helped in our cases, and could help in the case of the upper respiratory issues as well. Ginger, Zingiber officinalis, is practically a pharmacy in and of itself. Technically, the part that we usually refer to as the ginger “root” is a rhizome. Rhizomes are underground stems that put out both roots and shoots, they have also been called “creeping rootstocks.” Rhizomes store food and can help ensure the growth of the plant in harsh times. You can also grow multiple, new plants from one ginger rhizome. With that much growing potential, of course this herb is going to be fantastic! The main reason I reached for ginger is because it has been used throughout history to calm upset stomachs. Most women chew ginger candies when they are experiencing morning sickness during their pregnancy. 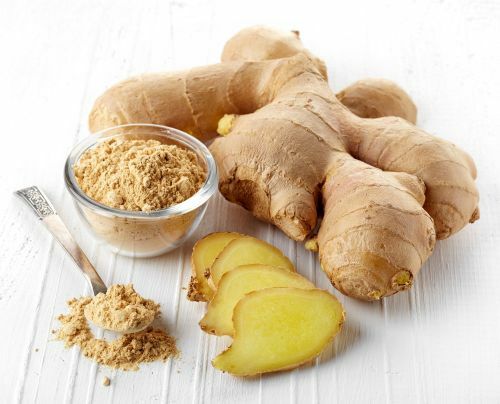 Sailors used to chew on ginger to help with seasickness. It is also, commonly, used to help with the nausea that accompanies chemotherapy. The beautiful thing about it, is that it won’t stop vomiting that is necessary. If you have gotten ahold of a poisonous substance, ginger will not get in the way of your body purging that substance. It will, however, prevent vomiting when your stomach is upset, as well as help your stomach calm down faster after vomiting. This is why many people believe ginger ale will help settle your stomach. The sad reality about that is that the ginger would actually work if the carbonation and sugar in ginger ale didn’t counter the medicinal benefits of the ginger. So when your tummy is unsettled and/or sore, reach for ginger tea instead of ginger ale. Ginger is also a great way to fight off most infections. It is strongly antiviral and antibacterial. Taking ginger as a preventative is, I believe, why it only took me 1 day to go through the main part of the illness that it took my husband 3 days to go through (he was the first one to get sick). Ginger also is a prebiotic. Prebiotics contain fiber that is not easily digested by us, but that provide food sources for the beneficial bacteria that helps to keep us healthy. Those beneficial bacteria help us digest our food and help to promote healthy immune system function. Ginger helps to promote a healthy level of those bacteria. It also helps to stimulate perspiration and reduce fevers. Ginger is also great to reduce aches and pains of all kinds. It’s both a pain reliever and an anti-inflammatory. This makes it great for the achy symptoms that accompany illness. It’s also great for arthritis, menstrual cramps, and general aches that come with working out. It can help reduce cough, soothe a sore throat, relieve congestion, boost immune function, and help to relive headache. This makes ginger the perfect herb to help with the cold and/or flu. Now on to the stuff that makes ginger even better year round. Ginger helps lower blood sugar, improve heart disease risk factors, treat chronic indigestion, improve brain function (possibly preventing Alzheimer’s), and lower cholesterol. But one of the #1 reasons that ginger is amazing is that it has anti-cancer properties! There are a number of studies being conducted around ginger’s potential in preventing and/or treating cancers. So far, it looks extremely promising. I hope I have convinced you of how amazing and awe-inspiring ginger is. If you have any experience with this amazing herb, or questions about it, feel free to leave them in the comments below!